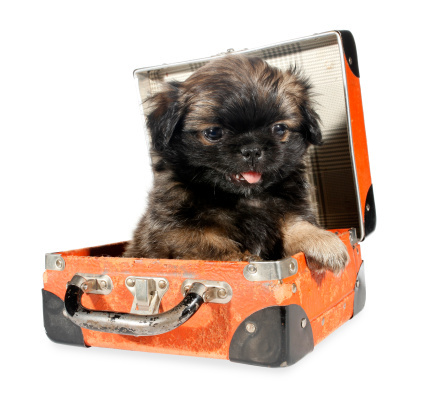 Travel season is here, and if you are like many pet owners, you will be packing a bag for your pet too. Traveling with your pet can be a rewarding experience, but a successful trip depends on more than packing your pet’s favorite tennis ball or catnip toy. To ensure the safety and happiness of your pet, start planning early, research transportation and lodging options, and make an appointment with your veterinarian. Most major airlines transport animals, but before booking a flight, consider all the factors, including your pet’s size and temperament and possible weather conditions. Pets that are too large to fit in a pet carrier under your seat must fly as checked baggage in the plane’s cargo section. Many animals become anxious in unfamiliar environments, particularly when separated from their owners, and can suffer both emotionally and physically during a flight. Sedation is not considered a safe option. Temperature extremes can also put your pet at risk. Many airlines do not transport pets during the hottest months of the year, or will not accept pets when the forecasted temperature is above a certain point. Look for flights in the early morning or late evening, when temperatures are at their lowest. Of course there are also safety concerns when traveling by car. Pet crates are strongly recommended. If an accident occurs, pet crates can protect animals from impact injuries and also prevent them from running out into traffic. Always research accommodations before leaving home, and make reservations whenever possible. Many hotels and inns allow pets but may have size and weight limits, breed restrictions, or a limit on the number of pets allowed per room. Campgrounds also have pet policies and occasionally prohibit pets altogether. State and national parks that allow pets often restrict them from certain areas, such as hiking trails and beaches. Most airlines require pets be examined by a veterinarian no more than 10 days prior to the date of travel. Be prepared to present health and rabies certificates at the time of departure. If you are traveling by car, pack a copy of your pet’s prescriptions and vaccination records. Some states require proof of rabies vaccination. Your veterinarian can also tell you if your pet needs additional vaccinations or preventive medications for the area in which you will be traveling. Be sure your pet is wearing a flat collar with identification tags at all times. If your pet doesn’t have a microchip, consider having one implanted. Know basic pet first aid, and carry a first aid kit. Never allow your pet to travel with its head outside the car window. Do not allow pets to ride in the front seat. They are at risk of being thrown into the windshield, can interfere with your ability to drive, or could be injured by an airbag. Disable electric window controls. Dogs have have been know to get their heads stuck in windows after stepping on the buttons. Stop for “potty breaks” every two hours. Always leash your pet before opening the car door.